Does Eating Moong Dal Reduce Belly Fat? 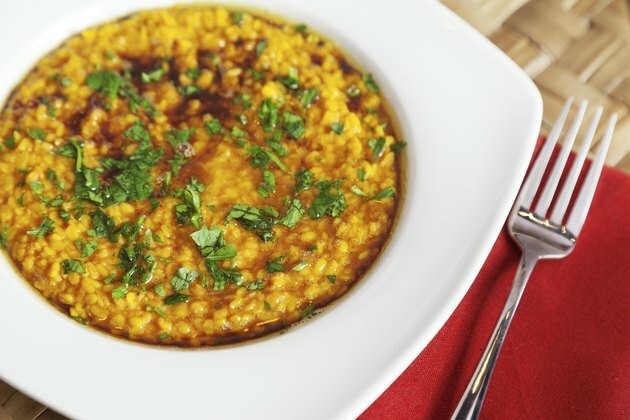 Moong dal, a hearty Indian dish made with mung beans, can be a nutritious part of a weight-loss diet, if it's prepared with healthy ingredients. Mung beans provide fiber and protein, two satiating nutrients that can help control hunger so you can reduce your calorie intake to lose overall body fat, some of which will come from your abdominal area. Dal recipes also call for a wealth of spices that may potentially have weight-loss benefits when combined with a sensible diet and regular exercise. In addition to mung beans, moong dal may also include onions, garlic, tomatoes, stock and a host of spices such as cumin, turmeric, jalapenos, ginger, cardamom, cilantro and black pepper. On their own, mung beans are high in fiber and protein as well as other essential nutrients, including potassium, iron, phosphorous and B vitamins. One-half cup of boiled mung beans provides 106 calories. That amount won't be increased much by most of the ingredients in typical moong dal recipes, except for ghee, a type of clarified butter, or oil. One-half teaspoon of olive oil provides 60 calories. Trimming abdominal fat can't be achieved by eating a particular food. The only way to lose belly fat is to lose total body fat by creating a calorie deficit. In a calorie deficit, your body burns more calories than you eat in a day. Once this happens, your body starts to use fat -- some of which comes from your midsection -- for energy. Where you store fat and how quickly you lose it from certain areas is partly determined by genetics, but your diet and other lifestyle factors play a big role. One-half cup of mung beans offers 7 grams of protein and almost 8 grams of fiber. If you include other vegetables in your recipe, such as onions and tomatoes, you'll increase the fiber count. In a study published in "Obesity" in February 2012, researchers found that during a five-year period, intake of soluble fiber, of which mung beans are a rich source, was inversely associated with abdominal fat gain. Another study published in "Obesity" in July 2013 found the same was true for protein. Overweight individuals who ate more protein lost more total body fat and abdominal fat than those who ate less protein during periods of calorie deficit. This study also looked at meal frequency and concluded that eating higher-protein meals, such as moong dal, more frequently may help people lose more abdominal fat than traditional three-meal-a-day patterns. In addition to adding a depth of flavor to your moong dal dish, the spices it contains may aid weight loss. Curcumin, the active compound in turmeric, suppresses the inflammation that plays a role in obesity, says a review published in "Annual Review of Nutrition" in August 2010. Capsaicin, the active ingredient in hot peppers, such as chili peppers and jalapenos, can help you lose total body fat, according to a study published in "PLOS One" in July 2013. Researchers concluded that when in a calorie deficit, 2.56 milligrams of capsaicin at each meal -- the amount in 1 gram of chili pepper, which is a little less than 1/2 teaspoon -- promotes fat oxidation.